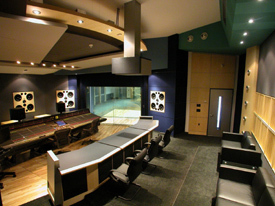 A world-class facility located in Bethlehem, PA, StarCity Recording Company offers clientele more than 50 years of combined professional recording experience and the state of the art in 5.1 surround sound. Since opening in July, StarCity has been abuzz with activity, finalizing numerous projects in the recording, broadcast and film industry. Notable StarCity projects include recording and mixing a Studio Jams session for the BET Jazz channel featuring Rolling Stones drummer Charlie Watts, and handling all post-production for Loggerheads, a critically acclaimed independent film that recently premiered in New York and Los Angeles. On the horizon for StarCity is work on Kansas' Dual Disc with legendary drummer Phil Ehart and the debut release of Nathan Lee Jackson, an up-and-coming country music singer/songwriter from Kentucky. 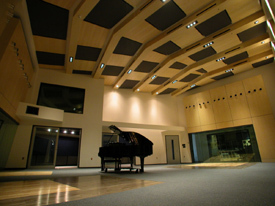 Acclaimed audio professionals and partners Jeff Glixman, Carl Cadden-James and Lily Salinas opened StarCity Recording Company, a state-of-the-art facility dedicated to full-service music and audio production in the heart of Pennsylvania. The trio, passionate music lovers, initiated this joint venture with the vision of providing a warm, creative, relaxed setting where artists could thrive outside the stifling confines of big city corporate pressures. Glixman, a Grammy-nominated producer and engineer, has worked with notable recording artists such as Kansas, Eric Clapton, The Allman Brothers, Bob Marley, and Ludacris. Combined sales of his projects are in excess of 30 million units. In addition to his production career, Jeff's love "of all things studio" led him to play an integral role in the development, operation and ownership of professional recording studios throughout the world, from Axis Sound Studios in Atlanta, GA to Caribbean Sound Basin in Trinidad. StarCity, housed in a magnificent 18,000 square foot location once temporarily occupied by the more corporately driven Angel Mountain Productions, is fully encompassing with respect to music and audio post-production services. 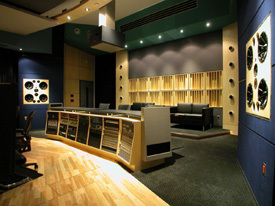 The facility is designed and purpose-built to accommodate 5.1-channel surround production in each audio space. All the control rooms contain soffitted monitors and automatic drop-down microperf screens with projectors to handle lock-to-picture requirements. 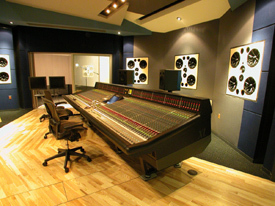 The main mixing and tracking room is equipped with a Solid State Logic XL 9000 K Series console and a scoring stage capable of accommodating a 40-piece orchestra. 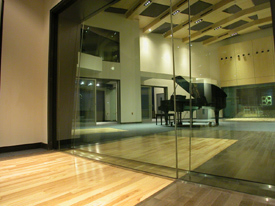 The audio post room, geared for film and television work, is attached to a 33' x 17' Foley studio, which can be utilized as an additional tracking space. An added attraction at StarCity is the well-appointed 30' x 40' THX-specified mix theater equipped with a 96-input Harrison digital film console and 6.1 Dolby Digital EX monitoring system. 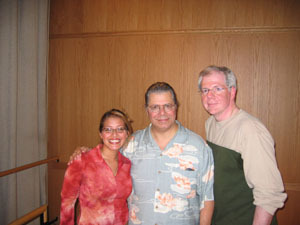 (l-r) Lily Salinas, Chick Corea, Tom Emmi, president of production company Ace Entertainment and education director at Philadelphia live music venue World Café Live at StarCity Recording Company, during audio acquisition, mixing and post-production of the upcoming MusicLab at World Café Live. The program will be available from iN DEMAND Networks, the leading aggregator and supplier of video-odemand, pay-per-view and HDTV programming. Joining Glixman at StarCity is Cadden-James, a 5.1 specialist with extensive background in both mix and audio post-production. Cadden-James is responsible for the systems integration design and implementation at StarCity. His talents range from writer/musician with recording artists Shadow Gallery to managing audio technologies for director M. Night Shyamalan to mixer with Jeff Glixman on many high profile 5.1 surround releases. "StarCity's mix and audio post suites are a great blend between the right tools and acoustic accuracy, allowing me to work with speed and confidence," Cadden-James stated. "With the industry's shift toward high-resolution surround audio and high-definition video, the artistic and qualitative bars are being raised; the heightened sense of an aural 'wow factor' is present in almost every blockbuster film I see now, and some of the music mixes today are absolutely on the edge. We intend StarCity to be the place where a stunning level of experience is fashioned and executed." 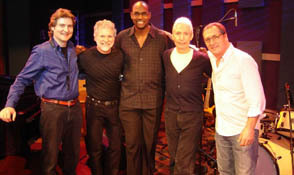 Studio Jams session captured offsite featured Rolling Stones drummer Charlie Watts with a group of A-list players including Stones sidemen Chuck Leavell and Tim Ries, guitarist Chuck Loeb and bassist Gerald Veasley. 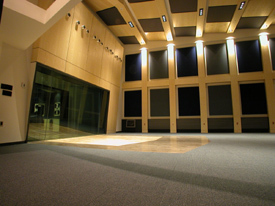 Cadden-James recorded the session in Philadelphia between the Stones' two dates at the Wachovia Center, and mixed at StarCity. Rounding out the StarCity team is Salinas. A relative newcomer to the music industry who possessed the natural skills to quickly propel her through the ranks, she assumed the senior manager role over Universal Music Group's East Coast Vault Operations, overseeing more than 180,000 priceless master recordings. Her natural ability to connect with people's core needs is a huge asset with both clients and record company executives alike. Said Glixman, "Lily brings to this hand-picked team the ability to immediately ascertain the needs of those around her and the skills necessary to fulfill those needs. We are confident that her deep industry experience will go a long way towards catering to that clientele who expect their high profile projects to be managed with professional sensitivity to all issues. Lily is a people person; she truly cares." To coordinate the amelioration of the existing facilities previously operated by Angel Mountain, StarCity has retained the services of Martin Pilchner, principal of noted design firm Pilchner-Schoustal International, Inc. . The objectives will be to redevelop the facility to foster a strong creative environment, and reduce the institutional aspects mandated by the previous tenant. "We want to give the studios a real engaging vibe, and avoid their proclivity towards the clinical and austere," says Pilchner. "The infrastructure here is fantastic, providing an easy transition to a warmer, richer and more creatively fertile space. Jeff and the project team have a keen sense of where we need it to be, and we are having a great deal of fun in helping them achieve their goals." Structural changes include the introduction of more decorative colors, conversational lounges, a private entrance and the addition of a new mastering/editing suite. These design changes reflect the StarCity team's philosophy of developing a peaceful alternative for performers to flourish. The studio's close proximity to New York City and Philadelphia - one-hour driving distance from each - makes StarCity the obvious choice for creative individuals seeking to escape inflated costs and the breakneck pace of overcrowded cities. Nathan Lee Jackson, a young, aspiring country singer with a flair for songwriting, recently signed with StarCity Productions, led by music industry veteran Jeff Glixman and partner Jim Gentile. Jackson is currently working with Glixman on his first album for StarCity Productions at StarCity Recording Company, a state-of-the-art, world-class recording studio located in Bethlehem, PA.